It may have taken a while for Maxim Choupo-Moting to find his feet in Germany's top flight, but on the back of an impressive campaign for 1. FSV Mainz 05, it would take a brave man to bet against the forward setting the 2014 FIFA World Cup alight this summer. Born in Hamburg to a German mother and a Cameroonian father, Choupo-Moting took his first steps as a footballer at local club FC Teutonia 05. He moved to Altona 93 in 2000, winning the Hamburg Under-10s Cup during his three-year spell with the minnows, before joining FC St. Pauli as a 14-year-old in 2003. Choupo-Moting spent just one season with the Kiezkicker, whose first team had been relegated to the third tier of German football the previous year, before Hamburger SV snapped him up in 2004. 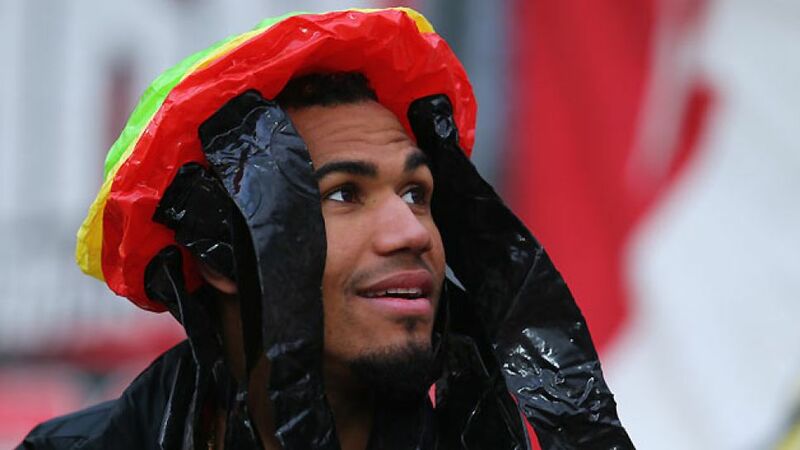 After two seasons with HSV’s youth setup, Choupo-Moting was named in the Rothosen’s reserve team squad for the first time half way through the 2006/07 campaign, before signing a three-year professional contract at the end of the season. The forward scored his first competitive goal in Hamburg colours in their DFB Cup victory against Holstein Kiel on 5 August 2007 and made his Bundesliga debut against Hannover 96 six days later. However, Choupo-Moting only managed to net two goals in as many seasons at HSV and when Bruno Labbadia replaced Martin Jol as coach in July 2009, the 20-year-old was loaned to 1. FC Nürnberg the following month. On 19 September 2009, Choupo-Moting scored his first ever Bundesliga goal in a 2-1 defeat to FC Bayern München. Despite only making ten appearances for the Franconians during the 2009/10 Hinrunde, he forced his way into coach Dieter Hecking’s plans and became a first-team regular towards the end of the campaign. He even finished as Nürnberg’s second highest scorer with six goals, but der Club opted not to sign Choupo-Moting on a permanent basis and he promptly returned to Hamburg. After being deemed surplus to requirements at the Imtech Arena, he signed a three-year contract with Mainz at the beginning of the 2011/12 campaign. The 1.89-metre man hit the ground running at the Coface Arena, scoring ten league goals to finish as the club’s top scorer, but a meniscus injury restricted him to just eight league appearances the following campaign. In 2013, Choupo-Moting grabbed ten league goals in 32 appearances to help the Carnival Club finish seventh in the league and qualify for Europe. Choupo-Moting has represented Germany at every youth level from the Under-18s upwards, and was even awarded the silver Fritz Walter medal - a series of annual awards given to youth footballers in Germany - in 2007. In 2010, however, Choupo-Moting was called into Paul Le Guen’s squad for the FIFA World Cup in South Africa, netting his first international goal in a 3-4 defeat to Serbia in a friendly on 5 June 2010. Choupo-Moting is now hoping to make his mark at the 2014 World Cup, having been named in Volker Finke’s final 23-man squad.